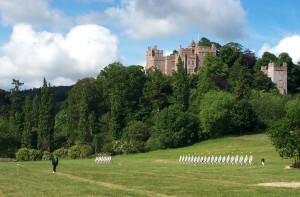 The Grand Western Archery Society holds it Annual Archery Championship Meeting at Dunster Castle Deer Park in June each year, set in the grounds of Dunster Castle which has been a fortified Tor since the late Anglo-Saxon period. The Lutterrel family have owned the Castle since the 14th Century, until 1976 when the Castle and most of its contents were given to the National Trust. The Annual Archery Meeting has been held in the west since 1861, and there have been many Lady and Gentlemen Champions, most notably Lucy Awdry who was champion 12 times, and Mr R Books-King who was champion 17 times, and was chosen to compete in the London Olympics, where he won a silver medal. 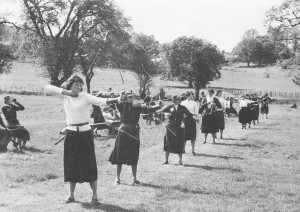 The very first Dunster Archery Week was held from the 15th to 22nd May 1955 and there were twenty targets were set out on the Polo Grounds. The event commenced with the Somerset County Championships on the first Sunday and finished with the Grand Western Meeting over the following weekend. The rest of the week was given over to practice and social events. The week was voted a great success, much of which was due to the warmth of the welcome extended by Mr and Mrs Geoffrey Luttrell and the beauty of the setting. The 2019 Dunster Archery Week will be held from 16th to 23rd June. For those who have the facility, we are set up to accept payment by bank transfer for Dunster Archery Week. Bank account details along with format of the payment reference you need to use are in the prospectus. Once again, this year I have drawn up a “smart” excel entry form which should prompt you to enter all of the details I need. The document is protected so that you can only type in cells which need to be completed, or left blank if not entering a round/fee. When you open it up the cursor should be in the 1stcell in which you need to enter information (title). Once you complete this, press enter (or tab) and it will take you to the next cell you need to type in. Please enter “X” or “Y” in the cell under any round you wish to enter. This will turn the bow style box red which should prompt you to enter the bow style you intend shooting, and pre populate the “fee paid” cell. If you enter late and/or want the target list/result sheet posted out to you, you will be able to enter the appropriate fee(s). The total due will be calculated for you. I am then asking you to enter details against the method of payment, cheque number or payment reference. I haven’t been able to get a definitive answer re maximum number of characters you can enter for a payment reference. If you do have a long surname just enter as many letters as you can following your AGB number. For example if the maximum number of characters 16, Mrs Talbot Ponsonby, AGB number 856321 would enter her reference as 856321talbotpons. If you are sending in more than one entry form and paying for them all by bank transfer, please use the AGB number plus surname of the person sending in the entries. Please complete all of the “tick boxes”, responding with “Y”, “N”, “N/A” or age as appropriate. In particular you need to complete the last two boxes which are outlined in red. If these are not completed your entry form will not be accepted. The “Additional information” box is quite small but if you type your entry form the font size should allow you to enter all of the details you need to.